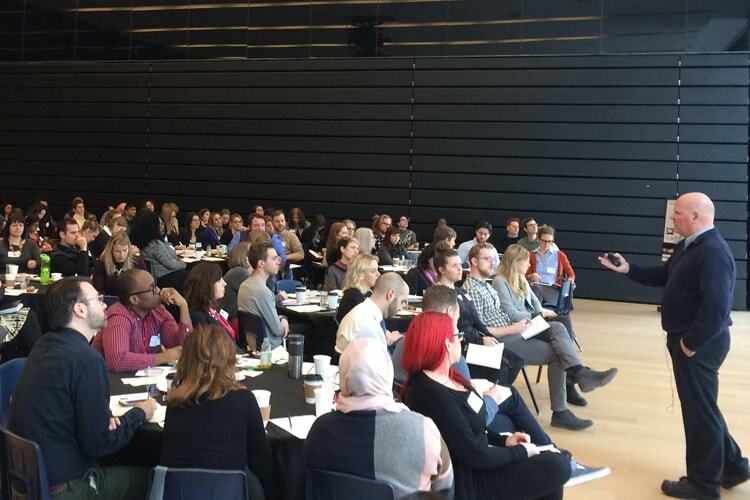 University of Toronto’s creative thinkers, writers and storytellers came together on Valentine’s Day for a day of learning and networking at this year’s Field Day conference. Communications staff from across the university’s campuses, faculties and departments packed into Desautels Hall at Rotman School of Management to gain inspiration from keynote speakers and to celebrate the accomplishments of their colleagues during case-study presentations. “One of the challenges at a university as large and decentralized as U of T is finding effective ways to learn from each other. We were thrilled with how engaged the audience was in learning not only from keynote speakers but also through a sampling of the strong communications work going on across three campuses. There is great professional talent here at U of T,” say conference co-chairs Linda Quattrin, executive director of communications at the Faculty of Medicine, and Lucianna Ciccocioppo, director of external relations at the Faculty of Law. Keynote speaker Mitch Sinclair, design director at design firm IDEO, taught attendees to think like a designer from different perspectives – an artist, an anthropologist and a psychologist. John Oesch, associate professor, teaching stream at Rotman shared his tips on how to be more persuasive. Shree Paradkar, columnist and digital editor at the Toronto Star unpacked the relationship between inclusion and ethics, and Mary Lynn Young, an associate professor at UBC Graduate School of Journalism, spoke about the launch of the academic journalism platform The Conversation’s Canadian site. Campbell presented a case study on how multimedia content helped a research story about stingrays chewing like goats go viral. The engineering communications team told attendees about how their out-of-the-box thinking when creating an offer of admission package led to higher acceptance rates, especially among women and lower project costs. Shilpa Gantotti, communications strategist at the Faculty of Applied Science & Engineering says sharing these experiences with colleagues across the university is a valuable tool. “We all face similar challenges in our positions as communicators, whether it’s doing more with less or finding smarter ways to work. Field Day was a fantastic way to leverage the learnings of others while reconnecting with colleagues,” she says. Communicators also took the stage to talk about U of T’s story hub “U of T World,” the Faculty of Medicine’s beautifully designed alumni magazine, U of T Mississauga’s creative holiday video and the Faculty of Arts & Science’s quirky illustrated student welcome guide. Erin Lemon, executive director, News & Media also introduced the U of T central communications team over a lunchtime chat. “Field Day really demonstrated the strength of the communications community at U of T,” says Lemon. “I think everyone came away with new ideas and new relationships – there was a real buzz in the room, a sense of common purpose."